With direct ocean views, this one bedroom suite provides stately features with a regal stature. Situated on the third floor, vistas and sea breezes are uninhibited by surrounding rooftops or foliage. Enjoy the sunrise skis and magical moonrise moments from your private lanai. Comfortably accommodating 4 people, this one bedroom suite features a king bed and queen sleeper sofa. The stylish interior includes a stately kitchen with a Wolf glass cooktop & oven, Sub-Zero refrigerator, GE profile microwave, Bosch dishwasher, granite counter tops, African Mahogany cabinets, a bathroom with Peruvian Travertine stone surrounds and a luxurious soaking tub. 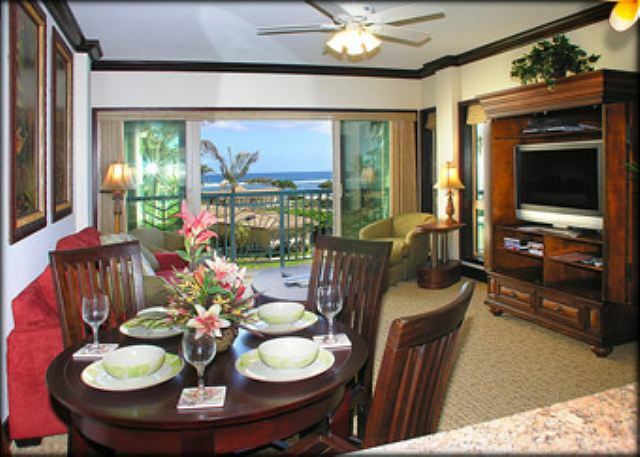 Enjoy the clean design and convenient location, with the beach and boundless Kauai adventures just beyond your private lanai. 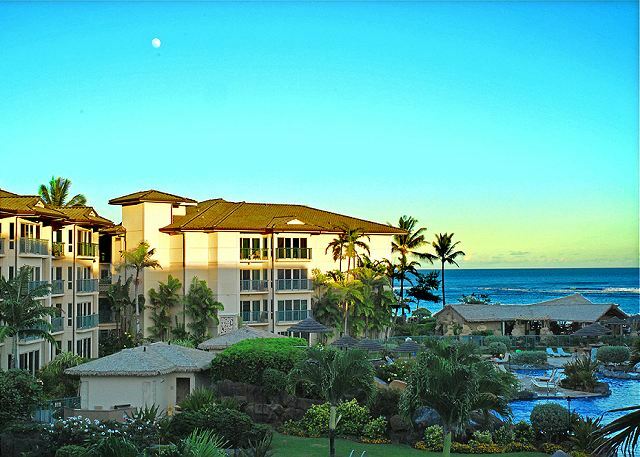 We loved our stay at the Waipouli Beach Resort. The condo was well-equipped and the location was perfect. The grounds were immaculate and beautiful. This was a vacation of a lifetime! We stayed in D312 and loved the view from our room. I loved watching the sun rise from the Kauai in the mornings and the room was spacious, clean, comfortable and we all enjoyed the tub! Our hosts were great and communicated well through their ap and they even helped us book some adventures. We loved our time here, everything was so perfect. It was meticulously cared for, bed was incredible, kitchen was full of upgraded equipment and the staff was great!! We were staying at Waipouli Beach Resort for our Honeymoon. It was perfect! Very nice condo with a well stocked kitchen, great pool with slides, hot tubes for only adults as well as hot tubs for families. They thought of it all! Beach access right there as well! It’s also in a super convenient location on the island with groceries right across the street and an easy commute to the South or North side of the island. Highly recommend! One of the nicest units we have ever stayed in, very clean, great location, beautiful pool, and great location. We will stay here again. 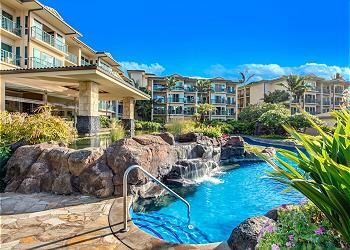 Entire rental process was easy using the rental host app that was provided by Kauai Exclusive Management. We found the resort grounds well maintained and clean. We would have liked food and beverage service poolside. The D312 unit furnishings are older and showing wear. Unit was clean but well used. Stayed at Waiapouli Resort for 7 nights. The rental process, including payment, checkin, checkout, etc was simple and easy. The unit was clean and provided toiletries and kitchen basics. We didn’t eat at Oasis because it was so expensive. This was our first visit to Kauai. I have to say we really lucked out with this location! Central, quiet area, and beautiful! The lazy river and pool area was a big hit, especially with our daughter, who REALLY loved it! The layout of the room is very comfortable and had all of the comforts of home. Everything about the property was great. The location turned out to be perfect because it was centrally located between the places to see in the North and the South. I love the resort, but they really need to do something better for access to the pool and gym-way too many numbers to put in! Everyone was complaining about that. Our unit wasn't fully blow dryer, water pitcher, etc...The mgt was very helpful about getting the missing items asap. The condo was amazing and so nice! Great view and the location was perfect! 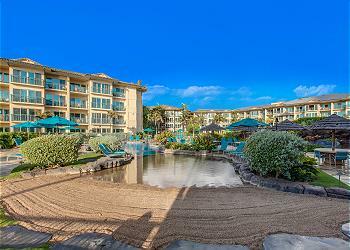 This vacation condo was absolutely amazing - great location, great amenities, amazing pool and beach access. We very much enjoyed our time here. The kitchen was equip with pots and pans, blender, cheese grater, peeler, plates cutlery etc. I would of liked a cutting board, can opener and bread knife for our stay (but minor things). There are beach chairs in the closet ! We will be coming back :) even right to D 312 !! Very noisy gardening each day when we were eating breakfast on the balcony at 11:00 am. Clean and comfortable, excellent customer service will come again and recommend to friends. The rental goat app was great to use, the room was exactly as described on line. What a view. Would definitely stay here again. 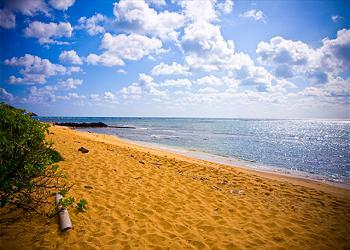 It is a mile from Lydgate state park, it has a walled off swimming area for beginner snorkelers. Great condo and facility. We used the hot tubs most as the weather was breezy, rainy, and cool but we had a great time together. Great food at the Oasis and we had not problems at all during our stay. some of the kitchen utensils were a bit cheaply made so did not work great. Great unit supported by great management! This unit is exactly as described! Clean and modern with a great ocean view. Directly across the street is a Safeway and Starbucks. On the resort is an equally great restaurant. During our stay on Kauai we also stayed in the North and South parts of the Island and this was by far our favorite for location and accommodation. The management company was easily accessible by email or through their app and were in contact before, during and after to make sure our stay was perfect. I would absolutely stay here again. Room D312 was amazing. When my wife and I first walked in, we were blown away by it. This is one of the instances when the room actually is more impressive in person that it is in the pictures. The stay was awesome. 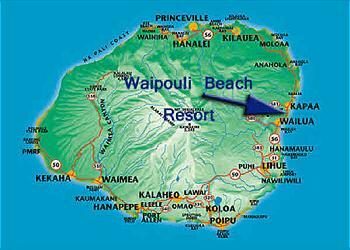 We loved our time at Waipouli Beach Resort in D312. The unit was clean, comfortable and well appointed. In particular, the kitchen was stocked very well so we always had what we needed to put together a meal. And the pool, grounds, Oasis restaurant, etc. were all perfect. 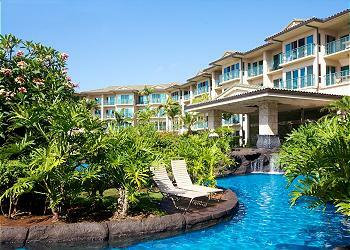 Really a great place to stay in Kauai. A wonderful place to stay! Exactly as described on their website. We recently stayed in Waipouli for Christmas and Kauia Exclusive were great hosts. The unit was excellent with commercial grade appliances an amazing pool area and perfectly located next to all the amenities one needs. 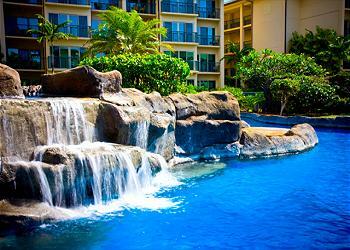 We will return in the future and definitely book again through Kauai Exclusive. Awesome, had a wonderful time. The condo's were great! D312 was such an enjoyable condo! The location in the complex was very quiet, the view lovely, and out of the wind! High quality unit, so beautiful and comfortable. The description was accurate and amenities useful. We loved the bike path (shared use path)& bike rack for rentals. Bicycling was great, saw whales in the distance,(even from unit lanaii), & biked to Lydgate Park for a swim. The resort is walking distance to many stores as well as eateries. "Adventures": Tubing in the mountains, kayaking the Wailua River with hike to waterfall, and catamaran snorkel/NaPali & whale watching cruise. There was a monk seal near the resort beach for a few days. 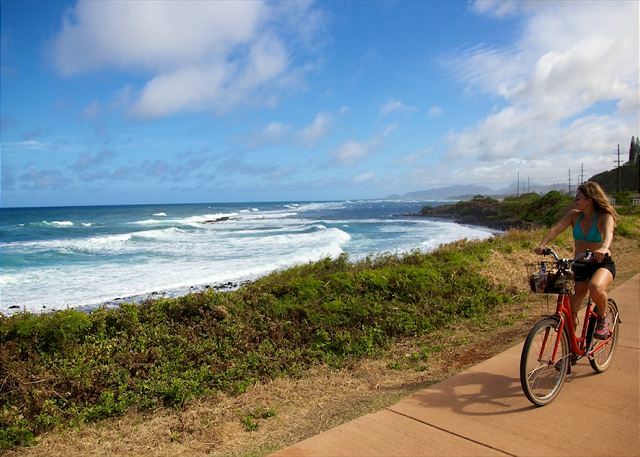 Kapaa is a great,central location. Resort never felt crowded and was so quiet! Great sound proofing! Would definitely recommend. Thank you! We had a wonderful time here. Location was very convenient for all the island activities we did. Beautiful pool and watching whales from our unit was a added plus. Looking forward returning someday. Our unit had a nice view over the resort looking out towards the ocean. Condo was well stocked and easy to access via elevator or stairs. Resort itself is perfect for families with young kids. Sandy bottom kids pool was fantastic and our 13 mo enjoyed the waterslide and the lazy river/waterfalls! Never had any problem finding chairs by the pool. Beach outside the resort is nice but isn't great for swimming (reef break and currents). When the tide is going out there are fantastic little pools that are nice and warm and perfect for little kids to play in safely. 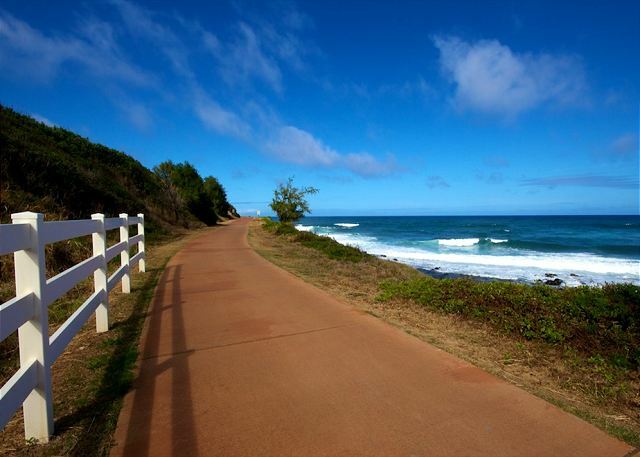 Resort is walking distance to swimming beaches and a short drive to surfing beaches. Restaurant on the resort is one of the best on the island IMO! Safeway and Starbucks across the road so super convenient to stock up on supplies if not into dining out every night. Same goes for drinks- can buy directly from bar at resort restaurant or BYOB. Cons: It would be nice if a crib/pack and play were available free of charge although I understand there are costs associated with keeping these in good shape and properly sanitized (I think we only paid $40 for the week). Likewise, we were not able to rent a high chair from the property management which would have been a great help with a busy young one (unless you don't mind constantly wiping peanut butter and mashed baby food off the windows and furniture). Fortunately there are several places on the island you can rent baby equipment from for reasonable rates. All in all I would say this is a great place for a holiday with children. 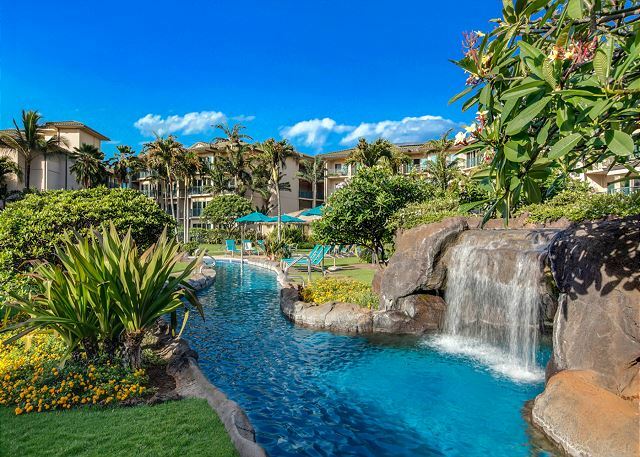 We have stayed at many 5 star hotels/resorts on different islands in Hawaii and this was by far our favourite stay for a family with a young baby. Don't think we will be doing a regular hotel-type holiday anytime soon but can't wait for our next stay at Waipouli resort!! This is a nice clean property, exactly as described in the listing. 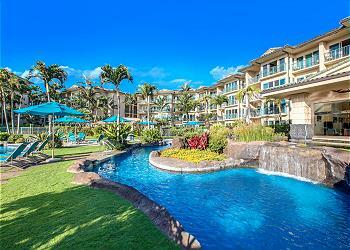 D312 is a clean well appointed unit with an ocean and pool view. The only problem was the WiFi. The general resort WiFi signal is very strong - but very slow with many dropped connections. WiFi specific to unit D312 was promised on arrival but never materialized . . .
We had a wonderful peaceful time at the resort.. Great location for access to the beach, bike trail & walking path and stores. We liked the views from our room, the pool is my favorite. Most restful time spent again on your property. The property was exactly what we wanted. The unit we stayed in (and the complex overall) was very beautifully kept and had excellent amenities. My boyfriend always complains about the beds when we travel, but this one was just as good as the one we have at home. I loved the unit and loved the property in general. I don't think I've ever given ANYTHING a 5 star review before, but I can't think of a single thing I would change. It was the absolute best 2 week vacation we've every had. Beautiful, well stocked condo, with great views, but plenty of privacy. If you want to escape it all, this is the place! Had a very good time. This place was recommended to us by friends and it was everything they described. Very good center location to get to both the south and north side of the island. We stayed in a one bedroom condo on the 3rd floor. The unit was very clean and comfortable with well stocked kitchen. Since the unit is facing the pool, it did get noisy at times with children enjoying the pool. The ocean view was limited. 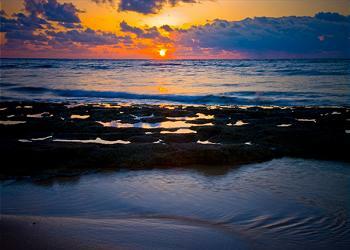 The Kapaa location was perfect for what we wanted to do - not too far of a drive to the north or south end of Kauai. There are many restaurants close by and grocery store and Starbucks across the street. Very convenient. 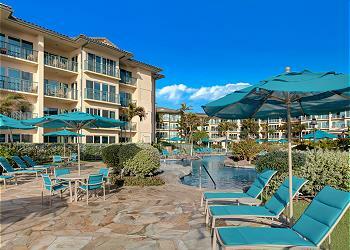 Waipouli Beach resort, D312, was a perfect place to stay in Kauai. Everything you need is there . . . and it is all top quality. The view is great, as long as they have trimmed the palms back a bit. We loved the location as it was in the middle of the island, allowing for easy travel times to the north and south ends. Great beaches nearby and lots of fun places to eat. If we go back to Kauai . . . this is the place we would stay. Our family loved our stay here. The unit was very clean and well appointed for 2 adults and 2 children. Mom and Dad enjoyed our morning coffee on the bedroom balcony- an awesome view while the children enjoyed the pool. The resort is absolutely beautiful with direct beach access and conveniently located to everything. Mom and daughter enjoyed a relaxing pedi at the spa while Dad and son went boogie boarding at a nearby beach. We were sad to leave, and look forward to our next visit! We spent a week in this lovely condo which overlooks the pool and has ocean views. It was extremely clean, everything was very comfortable and the kitchen was stocked with plenty of tools, pans, etc. I would definitely stay here again. The location is excellent, very central to take day trips north, south or west. Very family friendly spot, more so than for couples looking for privacy, but we still had a great time. It's too bad the beach here isn't really good for swimming, at least not during our stay there. But the pool and hot tubs made it a fun time. The restaurant onsite is pretty fantastic, and the oceanfront setting was definitely the best we found anywhere on the island. We had a great stay at Waipouli resort. Getting in was very easy as was checkout. The condo was beautiful, very well furnished and very well looked after. We had one small problem (a loose door handle) that was fixed without any bother. The people at the resort were all very helpful and easy to get along with. The only issue was the beach which was not user friendlly. However, the pool more than made up for that. We had a great time at this beautiful complex. The unit was outstanding and the management company was perfect. I would definitely recommend this company and place to anyone looking for a beautiful place to stay in Kauai. We loved this place. Everything is new, updated, clean. Even nice cookware. We appreciated every detail. Of course the view is great too. The condo has antiquated TV's and no HDMI connection that would work. Cable box had to be reset twice during stay. Condo is lovely, but for this kind of money I expected more. Also A/C is on an override so you can never get the room cooler than 74. Not sure I'd stay in D312 again. Overall excellent, pool lovely, good location for activities, grocery across street. My major complaint is that the air conditioning unit was so noisy when it was running, that we had to keep it off when we were in, and slept with the doors open. There were many parties going on in the pool because of Memorial Day and so a lot of noise coming in. Other than that it was very nice and my daughter and I enjoyed our stay. For first time visitors to Kauai,this was a great location and great resort. 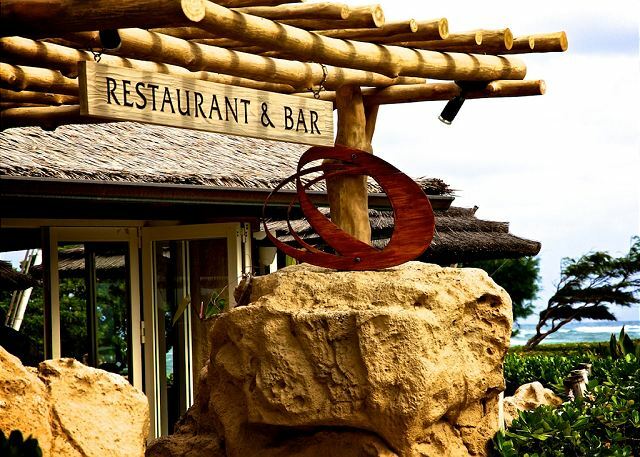 Convenient to many good restaurants, we particularly enjoyed Oasis, which is the restaurant right on the property. Excellent food and beautiful views. Also having the bike/walking path nearby that goes for over five miles was great fun. Great facility; great location; and the Oasis Restaurant is excellent! 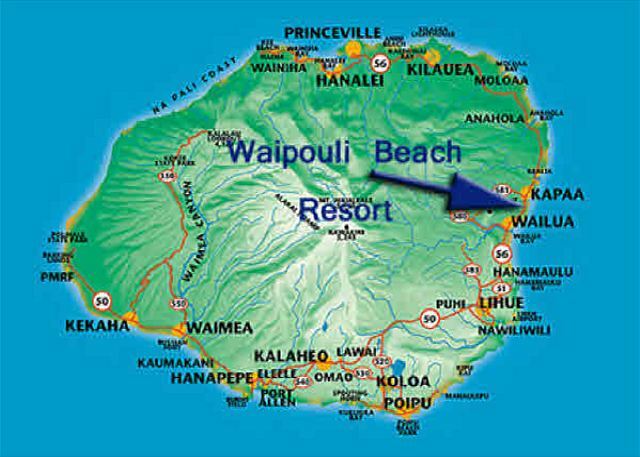 This is our 3rd visit to Waipouli Beach Resort and we would definitely return. We love the area, the proximity( feels like the center of the island, with only a short drive to either the north or south shores. The resort itself is great when not visiting other areas, the pool, the hottubs, the barbeques. We were also impressed with the many staples in the unit...spices, cooking oil, beach chairs, cooler boogie board. All the appliances are top of the line...highly recommend in fact we already have!! What a wonderful place to spend our vacation! We loved it! The condo suited us perfectly. Enjoyed relaxing on the lanai off the bedroom as well as poolside. No keys or keycards is a great feature. Beach mats provided were a nice discovery. Only thing I'll fuss about a little has already been mentioned by a previous renter and that's the shower's water pressure. One evening the Oasis restaurant had live music that we enjoyed from our room. Wow! The musician's were amazing! Our first morning (and others)we walked across the road to Starbucks then brought it back to the beach to watch the sunrise. Seeing God's handiwork displayed in such a beautiful way was a wonderful way to start our vacation. Walking along the path in to Kapa'a for breakfast and lunch is something else we liked to do. The concierge service provided was exceptional. We hope to return before too much time passes. This place was recommended by friends and we'll be passing our own review along. Everything was awesome,great,first class. The only thing I can complain about is the shower pressure,it was the worst EVER.Besides that it was a 5 star resort. Great location and upscale facility. Great for kids with the slide pool. We loved dining on the beach at Oasis and the fact that Safeway was across the street. The location is central to travel North and South on the island. We just finished a week at this beautiful resort. 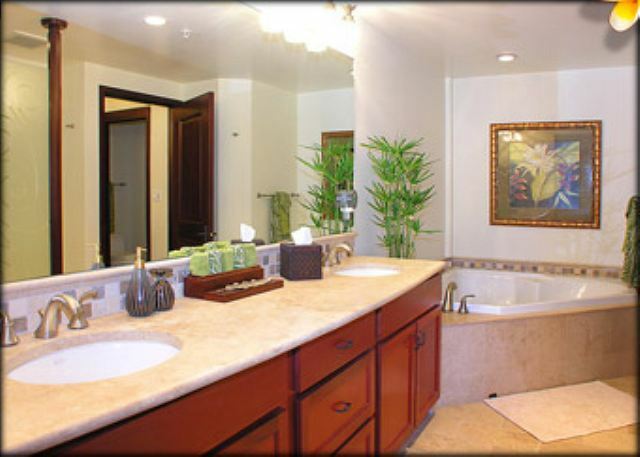 Everything was gorgeous and spotless, from the high end kitchen appliances to the huge corner tub. The convenience of the location(half way between the north and south shore)made it perfect for trips to either end of the island. If I had it to do all over again, I would definitely choose the same resort. Josh was incredible to work with and we will always request him at the time of booking. The property was beautiful...location great on east side....I believe we would enjoy an all adult property in the future...we really enjoyed the Oasis restaurant and the entertainment they had one night....only thing wrong in the unit was the DVD player wasn't working and we had planned to watch a couple movies. Overall the condo was great. I would say there are a few things that need maintenance. The blades in the clothes washer need to be replaced they are missing and the coffee table in living room needs bolts tightened. You could also add some light in the bedroom. we were dissatisfied the with the living room TV. The Time Warner cable remote had not been programmed properly and the DVD could not be made to work. The tv remote itself was kaput. The two of us had a fantastic stay in D312. The room had everything we needed. The bed was comfy. The view is a little obstructed thanks to a big palm tree, but still suitable. Very clean and well taken care of place. Much bigger than what you would get at a hotel. Family of four with 2 young boys loved the location. Nice appliances in kitchen. Professional and courteous property management team allowed us to stay past the normal check out time due to our late flight home. the Safeway and Starbucks....weather was beautiful, can't ask for more! I would highly recommend staying at this resort. It was clean, close to everything, friendly people, in fact, we are planning on going next year and would stay at the same place. Stay was great and would rent again. I did receive a call that we were not out on our last day and the cleaning staff wanted to get in.However, we rented for an additional day, paid, so we could use the property for the day prior to flying out at 9:30pm. Appeared communications were not clear. We are a family of 4 who stayed in D312 for 11 days and had a wonderful time there on holiday. My children really enjoyed the pool and kids pool. My husband had to work quite a bit and enjoyed the ocean view and air from our balcony. I am recommending this unit to my family and friends, especially my parents who I think would really enjoy the condo.